The TextDisplay object as it appears in the Toolbox. The TextDisplay object is used to organize the display of text to the subject. The TextDisplay is meant to simulate the display that the subject will see, and therefore immediately applies the properties set by the user. For example, in the Text field, the user will see the text displayed in the color specified as the ForeColor property. Likewise, setting the alignment properties to “center” will result in the centering of the text in the Text field. Text is considered a single entity to which properties are applied (i.e., all text is in the same font, forecolor, etc.). A new TextDisplay may be opened by clicking the TextDisplay object icon in the Toolbox, and dragging the object to the Workspace. For existing TextDisplays, clicking the object once with the mouse in the Structure view to select it will result in the display of that object’s properties in the Properties window. Double clicking an existing TextDisplay in the Structure view will result in that object being opened in the Workspace, as well as the properties for that object being displayed in the Properties window. A TextDisplay object opened in the Workspace displays the name of the object, along with the TextDisplay icon in the title bar at the top of the TextDisplay window. Below the title bar, the toolbar lists the tool buttons associated with the TextDisplay. Currently, the only active tool button is the Properties button. The Text window appears at the bottom of the TextDisplay. The Text window is used to enter the text to be displayed at run-time. 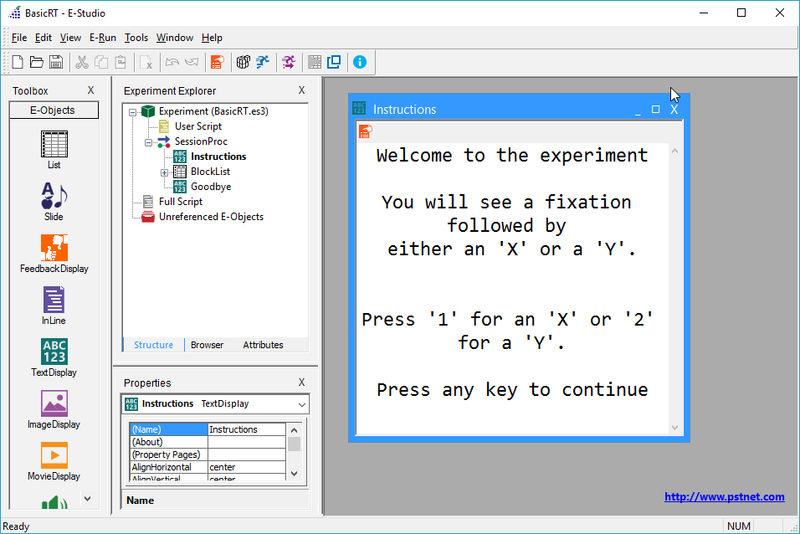 The TextDisplay is meant to simulate the display the subject will see during a run of the experiment. Using the Properties window or the Property pages, the properties of the display may be set. The setting of observable properties (i.e., ForeColor, BackColor, Alignment, Font, etc.) will take effect immediately in the Text window of the TextDisplay. Constant text may be typed directly into the text window, or a bracket/attribute notation may be used to vary the text to be displayed. The bracket/attribute notation (i.e., [AttributeName]) indicates to E-Run that the information requested is variable, and E-Run will look to the currently running List object to resolve the value of the attribute name in brackets at run time. The properties for the TextDisplay may be set using the Property pages. The Property pages may be displayed using the Property Pages tool button on the TextDisplay toolbar or by clicking the elipses (…) in the Property Pages field in the Properties window (select the TextDisplay in the Structure view to display its properties in the Properties windows). The Property pages open by default to display the General tab. The General tab allows the setting of the text to be displayed, and the observable properties of that text. If text has previously been entered into the Text window on the TextDisplay object, this text is reflected in the Text field on the General tab. Enter the text to be displayed at run-time. Defines the horizontal alignment of the contents within the frame (display area). Defines the vertical alignment of the contents within the defined frame (display area). Controls the clearing of the defined display area after the object’s termination condition is met. Toggles the WordWrap feature on or off. Specifies which display the TextDisplay will appear on. Color value (RGB values), Specific color strings (e.g., black, maroon, lime), Attribute references. Sets the ink color for the display of text in the Text field. The background color on which to display the text characters (functionality depends on BackStyle property). 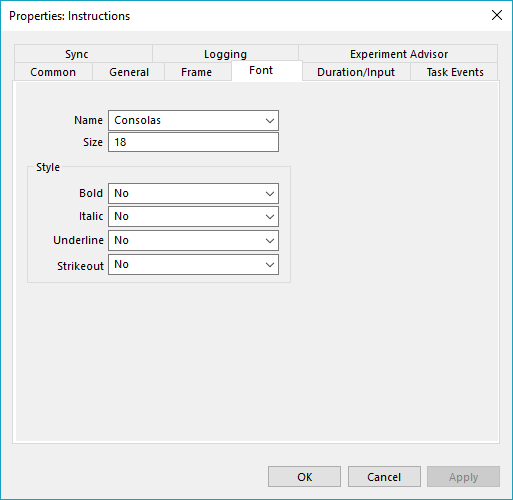 The Font tab allows the setting of the properties related to the font to be used for the TextDisplay. The font name may be typed into the FontName field directly, or may be chosen from the dropdown list of fonts available within the system. The Point Size represents the size of the font and may be typed directly into the field. 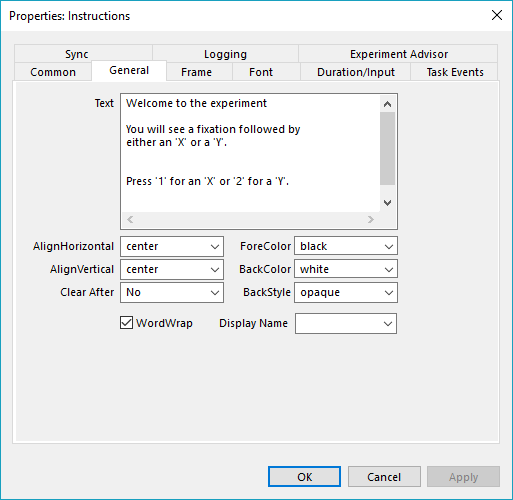 To access custom fonts, the custom font must be installed on the machine via the Windows Control Panel. 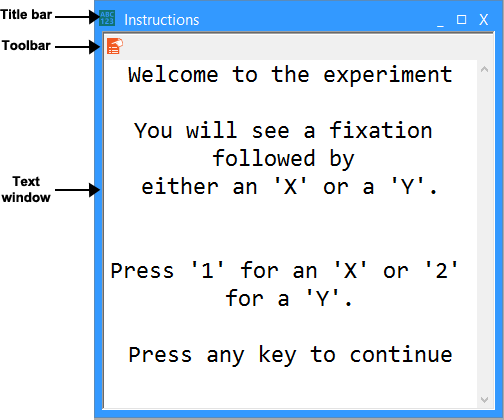 The font must be installed on all machines running the experiment using the custom font. Name Specifies the name of the font to be used for the display of text. Point Size Specifies the size of the font. Style Bold Sets the bold status of the text. Italic Sets the italic status of the text. Underline Sets the underline status of the text. Strikeout Sets the strikeout status (i.e., line drawn through the text). (Name) String values Assigns a user-entered string as the name of the TextDisplay. (About) --------- Displays the About TextDisplay dialog. (Property Pages) --------- Opens the Property pages for the TextDisplay. AlignHorizontal Left, Center, Right, Attribute references Defines the horizontal alignment of the contents within the frame (display area). Data Logging None, Standard, Response Only, Time, Audit Only, Custom Determines whether data is logged to the data file, and which attributes are included. FontBold Yes, No, Attribute references. Indicates whether the font should be in bold style. FontItalic Yes, No, Attribute references. Indicates whether the font should be italicized. FontName Dropdown list created Indicates the name of the font to be used to display the text. 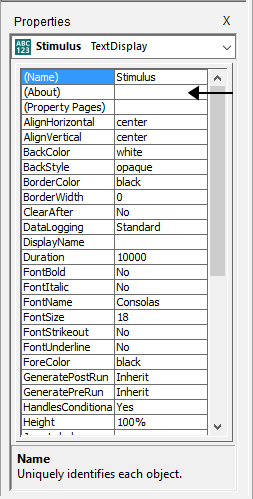 FontSize Integer values (e.g., 10, 12) Indicates the point size of the font. FontStrikeout Yes, No, Attribute references. Indicates whether the font should be in Strikeout style (a line drawn horizontally through the text). FontUnderline Yes, No, Attribute references. Indicates whether the font should be underlined. ForeColor Color value (RGB values), Specific color strings (e.g., black, maroon, lime), Attribute references. Sets the foreground color for the display object. Text String values, Attribute references. Sets the Text to be displayed when the object is run. WordWrap Yes, No Indicates whether or not to wrap the text within the defined frame.